In Auto-Anchor mobility solution one objective is to assign guest users into a single subnet IP irrespective of their entry point to the network. 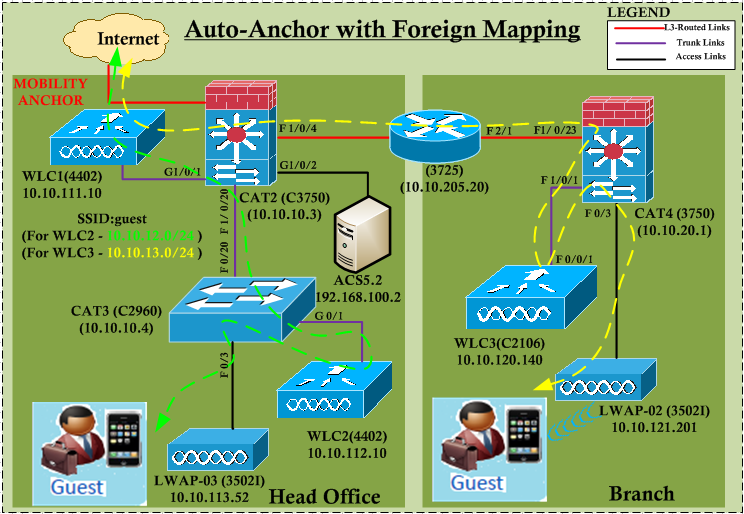 But if you have a large corporate environment with multiple locations & you want to allocated guest users to different IP subnets (for managing & reporting purposes) within this Auto-Anchor deployment model, how do you do this ? 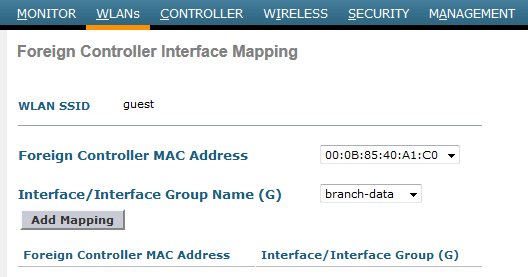 In the Anchor Controller you can configure a feature called “Foreign Mapping” under WLAN to facilitate this. This feature introduced in WLC 7.0.116.0 software code. Here is my topology to test this. In here we will map two different foreign controllers (WLC2 & WLC3) into different interfaces at Anchor Controller (WLC1) for guest users. Now if you click foreign mapping on guest WLAN on WLC1 you would see a page like this. Now you need to map WLC2 MAC address onto vlan 12 interface & WLC3 MAC address onto WLC3 MAC address by selecting required foreign WLC MAC & interface name & click “Add Mapping”. See below screen capture. You can do this via CLI as well. Here are the CLI commands required for this. Now you can verify the guest users at these two locations get IP from those two different subnets. I have two connections to guest wireless network at these two locations. Here is the WLC2 (in Head Office) associated client detail. Here is the WLC3 (in Branch) associated client detail. If you look at foreign controller about these client detail you would see a output like this. Note that client IP, User information is not available to this WLC as client traffic is tunnel back to anchor controller. As you can see this feature is very useful to have this in your guest wireless environment. If you need, you can pool multiple subnets using interface group (or vlan select) feature in order to maintain large guest user environment at a single location. In this case you need to map interface group at anchor controller for a foreign controller. Can you please clarify one thing. In this configuration example what is the interface of the guest wlan on the anchor controller, or it should be an interface group? By default guest wlan on anchor controller could be on any interface available on it (vlan 12,13 or any other). What this feature do in this topology is, if guest is coming via WLC2 then they will map to vlan 12 & if guest is coming from WLC3 they will map to vlan 13. No interface group required on anchor controller. 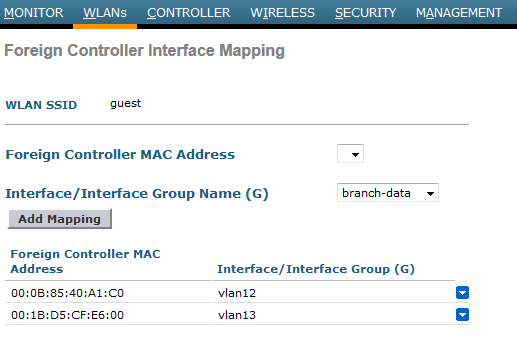 If your environment is big, so even for WLC2 guests you can have multiple vlan assigned on anchor, then you can create multiple interface groups (ie one interface group per foreign WLC) & map interface group name instead of interface name. This is a really good post. Helping me to understand mobility anchors. I have a current design where we have 2 WLCs in HA SSO. We have a large environment so we have different AP groups. We are mapping different VLANs to the different AP groups to 1 Guest WLAN. We are using one mobility Anchor for the Guest WLAN. 1. Configure WLAN for guest and leave it as default mgmt interface. 2. Per AP group, assign the WLAN to the same mgmt interface. Foreign mapping feature is useful when you get multiple foreign WLCs(or internal WLCs). What I understand you got only one foreign WLC (HA pair), so in that case it does not make sense using “Foreign Mapping” feature. In general guest deployment, see below answers to your queries. 1) Before enabling foreign mapping, you mentioned that i should have made the auto anchor first. While doing the auto anchor, i’ll be already defining 2 different WLANs on the Anchor WLC (one per foreign), right? If so, each WLAN has its out output dynamic interface. So, what is the need for foreign mapping? OOOOR, There is only 1 WLAN on the Anchor? If yes, why not configuring 2 WLANs? 2) What if i have single foreign (or even multiple) and i define different guest WLAN per AP group? So, i have multiple guest WLANs? In this case, i’ll be having multiple Guest WLAN on Anchor, right? 3) What if the Guest WLAN is an interface group. Interface Group should be defined only on Anchor and can be management on foreign, right? One more question, for your setup, you assumed that auto-anchor is already done. But, when doing so, on the anchor, i have only 1 SSID for guest, right? Which interface it should be assigned to (VL12 or VL13) or Mgmt (Since the mapping is done on the foreign mapping page)?